Australian-born Holt works with skilled artisans in remote villages in Mexico to create her luxe range of kaftans. Limited editions are created, and collected by women all over the world. Bright hues, a relaxed silhouette, incredible detail and a carefree holiday aesthetic are the hallmarks of Pippa Holt Kaftans. They are on every style-conscious mother’s wish-list and now you can have one for you, and one for your mini. 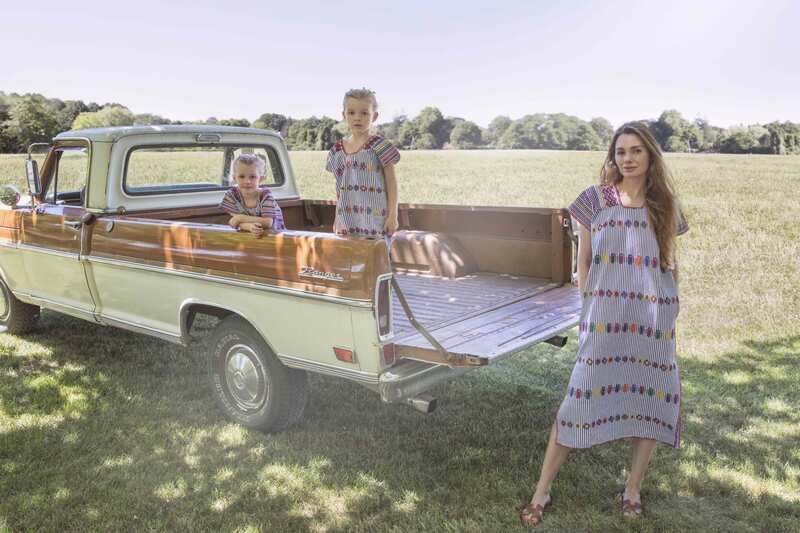 Collaborating with photographer Claiborne Swanson Frank (author of the coffee table tome Mother and Child), the new children’s collection has been beautifully captured in the Hamptons, and is exclusive to Holt’s own e-commerce store and Matches Fashion. 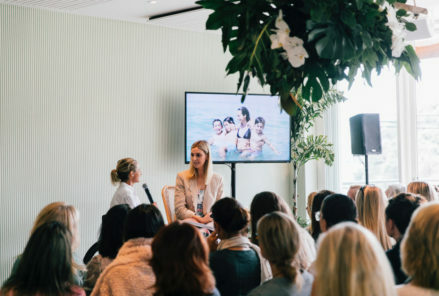 Those following Pippa’s globetrotting beach to city style on her private Instagram account were curious and wanted to know more. When Matches Fashion and Moda Operandi said ‘we want the kaftans’, the label was born. Where did the Pippa Holt Kaftans journey begin? I always liked the idea of starting a holiday collection. When I was living in Texas my husband and I went to Mexico to research textiles because I always loved ethnic and far-flung pieces. There I found some beautiful artisans who made these wonderful kaftans. So I bought some and I brought them back to Texas and it was so hot that that’s all I could wear for a whole year living there. I thought these are so beautiful and I love them and one day I might do a business with them. Then I moved back to Europe and had another child but I kept wearing the kaftans and people would stop me to ask where they were from. Gradually, I could tell that there was a market for them and after my third child was eight months old, I stopped breastfeeding and got on a flight to Mexico to go and meet the artisans again. Only through my private Instagram did it get some traction from people like Ruth Chapman and the PR from Moda Operandi who follow me. They were like hang on a minute ‘we want these kaftans’. So then Moda Operandi said they’d do a lookbook and it just grew organically with the wholesale accounts. Women fell in love with them and collect them basically. What’s the process like behind each piece? The wonderful women live in a very remote village. This particular type of weaving has been in this area of Mexico for generations and hundreds of years, but it was a craft that was dying out. What’s happened is that because the people love the kaftans, the skill is being revived and we’ve now got over 200 weavers making the kaftans. They’re very happy because they’re getting money to rebuild their houses, their children are getting a better quality of water and food. So the weavers are very pleased and they’re proud of their skill and that people around the world also appreciate it. Each piece takes around one month to make and the children’s kaftans around two weeks to make. Every kaftan is ongoing, but they go in and out of availability because they’re all limited. So, for example, I’m wearing number 39 now but there are no more of these for a while now. They come in and out and women know their numbers and suddenly when it becomes available they pounce on it and then it’s gone again for another two or three months. What are your thoughts on the slow fashion movement? I think it’s the future of fashion. People get exhausted by that fast fashion calendar. Especially if they’re a small team, there’s a lot to keep up with for buying appointments. I don’t pay attention to seasons and I think buyers don’t mind, they just work with the brand and they understand that I’m a bit different. How has your personal style been injected into the brand? I love beautiful colour combinations and the weavers often help come up with the combinations. They’re incredible at it. But sometimes I go in and say ‘a little bit more of this or let’s do a navy and white one’ I put that to the weavers and they come back with different prototypes. You used to work for British VOGUE, do you love the flexibility that comes with running your own business? Yes, I’ve always wanted that. When I worked with VOGUE, I thought one day, I’d love to do my own thing and create my own business. I loved starting it and it was much smaller in the beginning – I didn’t even set up an Instagram account for the business until six months after launch because I always just kept to the pace of my children. It is good to have your own flexibility. The pace has got a little faster now! It was basically inspired by our clients’ requesting it! I also remember seeing the weavers’ children wearing kaftans and it made sense to expand the range into childrenswear because a lot of my market are mothers. When I started wearing them, I was tired and needed outfits that were easy. To throw on one garment in the morning was simple. I had three children three years old and under when I started creating them. Our clients love the ease of wearing the kaftans. I love Claiborne and I’m a big fan of her work. She started wearing the kaftans two years ago. She found them right at the beginning and we connected. When she launched her own book, Mother and Child, with herself wearing the kaftan in her book, it was the most beautiful image of the brand that I’ve ever seen. I just adored it. When I did my pop-up in June, she came to the launch and was really sweet. I had in mind the dream of doing a shoot like those that feature in her book Mother and Child for this launch – I didn’t think it would ever come true.